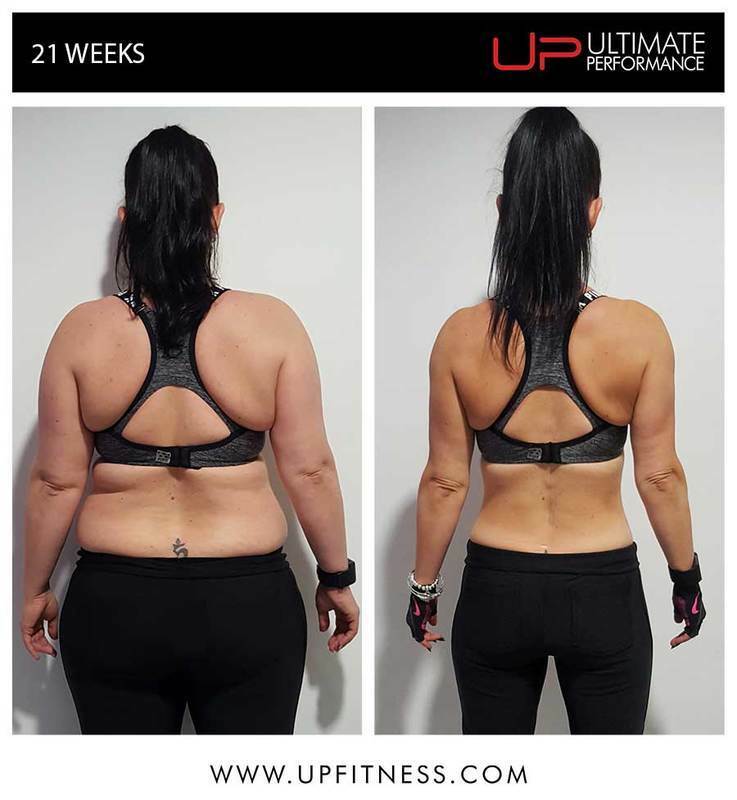 A business area manager has dropped three dress sizes in just 21 weeks after losing an astonishing 20kg (just over 3 stone) training at Ultimate Performance. 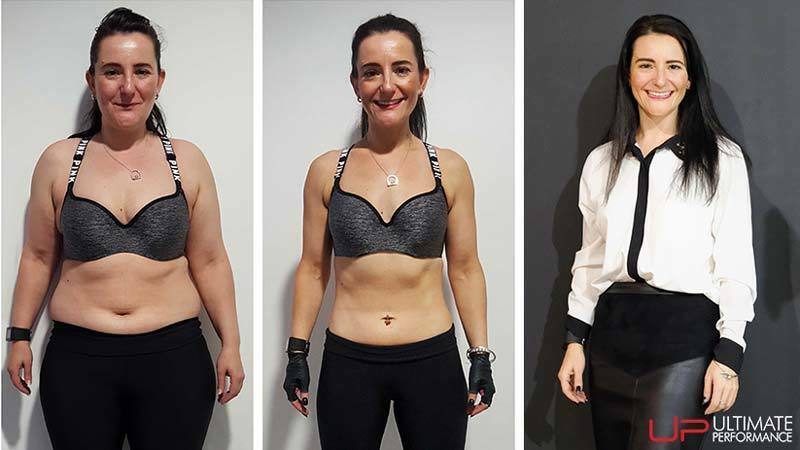 Rachael had never trained with weights before, but it proved to be devastatingly effective and helped her shed body fat and get in the best shape of her life. 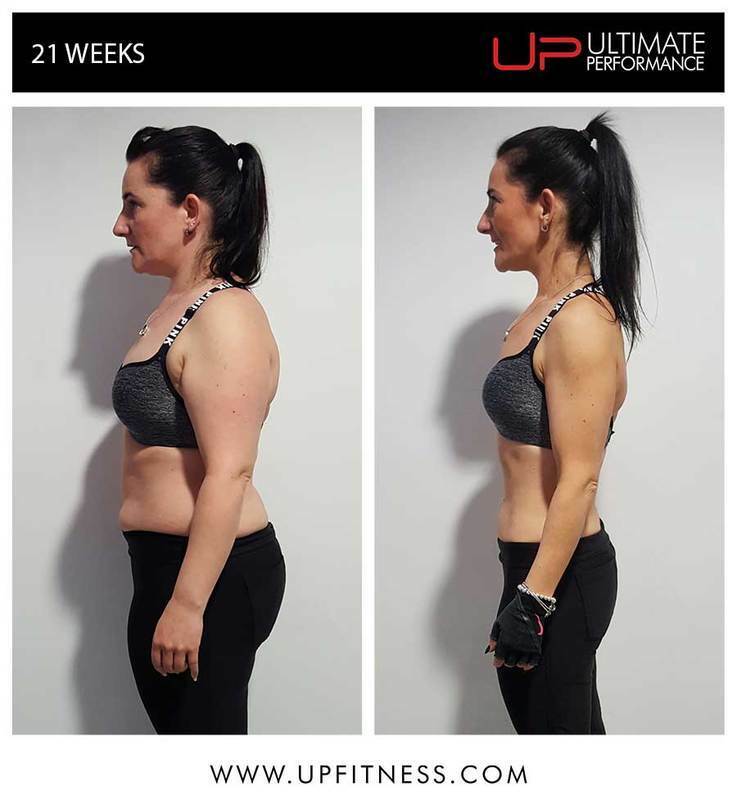 She admits that before starting her journey with UP, her hectic work schedule, life on the road and entertaining clients had taken its toll on her body but working with her personal trainer at UP soon changed this and the results are outstanding. 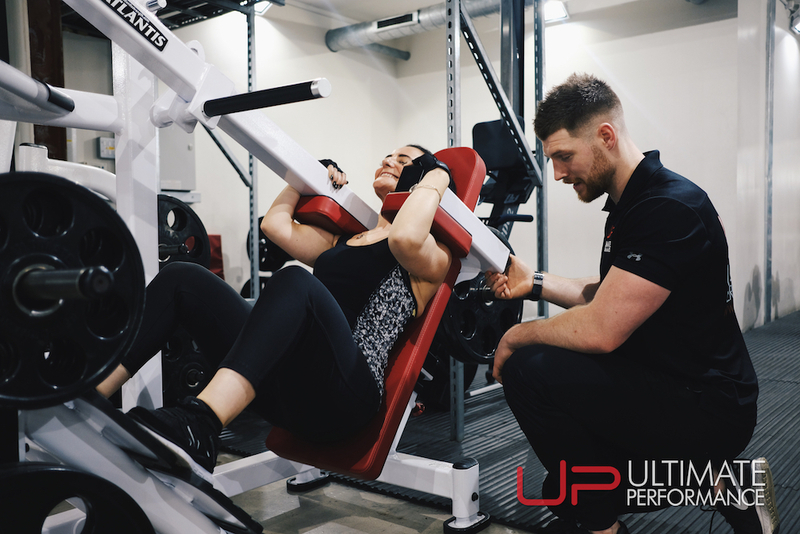 If you’re inspired by Rachael’s incredible results and want to start your own body transformation journey, speak to us today about our UP Personal Training plans. “My job is hectic. I spend my life on the road, and I’m in a different city every day. I spend time away with work, and there is always lots of client entertaining and meals out, so it can be quite full on. I also burn the candle at both ends because I have an active social life as well”. Rachael knew that her diet wasn’t the best, even when she tried to eat healthily and found herself feeling very tired and drained but would always put this down to being ‘busy’. 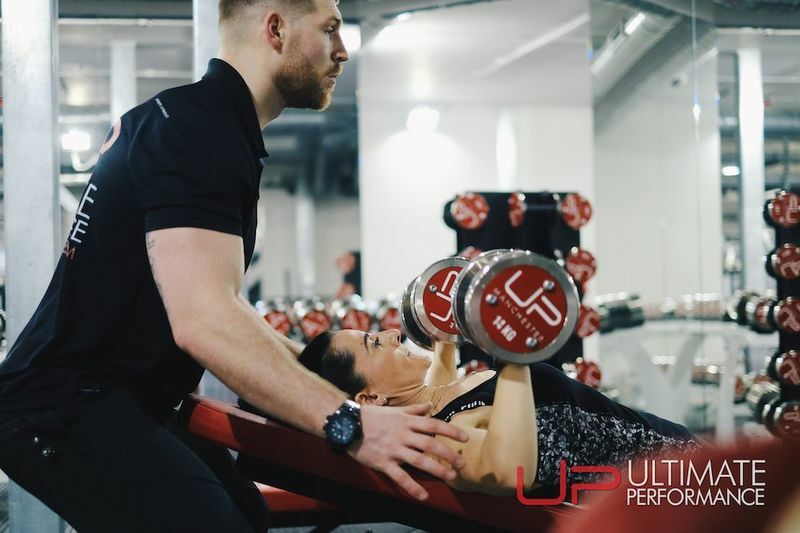 Rachael admitted that she was initially nervous about coming to UP but soon had a change of heart once she had arranged her initial consultation. “It was nice to be able to sit down and talk to someone and say this is what I want to achieve and not be judged. That was one of the things I was worried about coming in, I just thought ‘oh gosh, they’re going to think I’m so unfit, all be super fit, judge me and make me feel really small’ but they didn’t. It was just really friendly and really relaxed. You can see even more of our incredible Real Results right here. After not considering weight training in the past, working with a personal trainer and lifting ‘heavy’ was completely new to Rachael. “The training, I’m not going to lie is hard but at the end of the day if you want results ‘you go hard, or you go home’. “It’s hard, but at the end you feel amazing because you’ve done a really hard session and feel epic! “I just feel like I’ve got ‘me’ back and it’s a really nice feeling, it’s a nice feeling to know that you’ve got yourself back and back to the person who you always knew you were. “I hadn’t pursued weight training before because I think I was scared and didn’t really know what I should do or how I should do it. Whenever I went into the gym, it was always a load of guys, lifting loads of weights, huffing and puffing. “I have been doing things in the gym with my trainer that I just did not think I would be able to do and lifting weights I didn’t think I’d be able to lift. “I’m now on what I call ‘the big boys’ rack of weights which is the big one in the corner and that’s an achievement for me. Just loads of different exercises that if you put me in a gym and said ‘go ahead and do them’ I would have looked at you like you’ve come from space. “It’s also taught me that I’m not going to break. “That I can lift more than I ever thought I could, which is really quite a nice feeling so for me now it’s become more of a challenge. “It’s like ‘okay, let’s see if we can progress, you’ve lifted that, let’s see if we can do more’. Then you start setting goals, which gives you a focus and because it’s not a work-related goal, that’s what I find gives me more clarity because it’s something different to my day-to-day. I can come in, do my workout, give it my all and then go home. “I can see changes in my body which is brilliant, but at the end of the workout, I do feel a bit like Wonder Woman. Rachael has put her dramatic fat loss down to the amazing support she has had from her personal trainer, Steve. “I have now got somebody who is in my corner. “It’s really nice because they are really genuinely happy when you do well, when you’ve hit a goal or done something new, or you’ve hit a personal best in terms of what you’re lifting or carrying, they’re just really really happy and I wasn’t expecting that. “I wasn’t expecting the ‘buy in’ that they have into you as a person, they just seem to be really pleased that you’re doing so well. And have a real vested interest in it. “And they’re not there to tell you that you can’t eat that and you have to live on dust. I was a bit worried in the beginning about feeling deprived and not being able to eat certain things and seeing it as a ‘diet’ – well, it’s not a diet, it’s a lifestyle change. “I’ve completely revolutionised the way I look at food, how I understand food, what it does for me, what it doesn’t do for me, what things work for me. “It’s been a revelation really. I thought I’d read all of the magazines, all of the articles and thought yeah I know about this healthy eating stuff but no, I didn’t. “I didn’t think it would have such an impact on my sleep – changing my diet and actually exercising. Just being able to feel that I can do anything. I think if I set myself something I can do it – nothing is too much, nothing is impossible. “There probably will be a lot of people out there that think these are not real people; they are real people! I’m a real person; I do exist, I have a normal life and a normal job. “I have more muscle that I thought I would, which is something that really pleases me. I’ve definitely got a shape that I’ve not had for a long time, so it is possible. “I could have gone super crazy, cut everything out, not drank, not gone out and turned into a social hermit…I didn’t. “I’ve got a life, I’ve gone out with friends, I’ve been out for dinner, and I’ve gone out for drinks. Would you recommend UP to others? “I would most definitely recommend UP. I don’t think I could have another personal trainer now because I’ve been to UP. “It’s something I can’t quite describe; how professional everybody is, how invested they are in your success and how they just want you to do well. “They will take you to a level that you never thought were possible, have you doing things you didn’t think was possible, and they will get you into a shape in a real short period of time that you probably wouldn’t think was possible – but it is, it is possible. “It’s just been a really really great experience; I know a lot of people say ‘oh yeah it’s changed my life’ and a lot of people see that as being clichéd, but it really has, it really has.